One nice thing about wintertime is that citrus is pretty cheap. While I can't compete with the lucky-dog co-authors of this site that have lemon trees in their backyard (and they know who they are), lemons at my local grocery store are currently running about 15-20 cents each, and good juice oranges can seemingly be had for the asking. The Bronx was a child of Manhattan, actually: invented at the Waldorf-Astoria (the old location, where the Empire State Building is now) by ace bartender Johnnie Solan, who lived in the Bronx and came up with the drink's name a couple days after a visit to the Bronx Zoo. 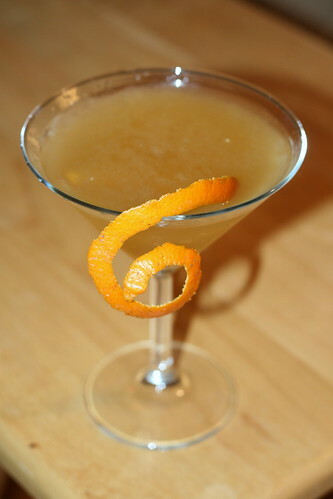 A Perfect Martini -- i.e., a Martini with equal parts sweet and dry vermouth -- with the addition of orange juice, the Bronx is "clean, simple, and very, very refreshing." I agree with Wondrich, though, and think I'd like it better if it were a little less Arctic and a little more sweltering outside. Bronx, we'll meet again in June. Shake and strain into a chilled cocktail glass. Garnish with a twist of orange peel. The Bronx Cocktail is one of my all time favorites. I've been living in Guatemala for the past month and the fresh fruit is incredible. Even better than being able to get a couple kilos of oranges for next to nothing, for less than $2 US, I can 2 liters of freshly squeezed orange juice. Fresh from the oranges and into the reused coke bottle. They make good mixers with cheap rum! Just made this -- fantastic! You're post is right on par with mine. I just did a taste test of the best bitters for a Manhattan and Old Fashioned. It required a lot of of rinsing and spring water :) The orange notes of Peychaud’s were ultimately my favorite of the group. I think I'll have to make my own bitters next. Free Brothers makes a nice "specifically orange" bitters. Great Blog! Always forget about this one and love coming back to it.